honor and facilitated the development of the area. He cautioned against any attempt to project the agitation for an Imo State governor of Imo State of Mbaise extraction as a parochial or clannish sentiments. He urged all the governorship candidates of Mbaise extraction to, “embrace the waving of rights and demonstrate that Mbaise has a solid candidate that can rebuild Imo State and return her to her lost glory. Let us demonstrate to the people of Imo State that the candidate we are backing is one with unbeatable qualities and records”. and infact and in law, undisputable. acceptable and reliable son or daughter of Owerri zone to the Douglas House. Also in his remarks, the President General of Ezuruezu Mbaise, Barr. from Owerri zone must occupy the Douglas House in 2019 and wen further during the Is anniversary of the Declaration to adopt Rt. Hon. 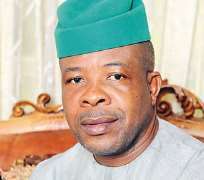 Ihedioha as it's candidate for the 2019 governoship election. In his remarks while moving the motion for the adoption of Hon. structures on ground to achieve victory at the polls next year. In their separate reactions, former Minister for Foreign Affairs, Prof. Viola Onwuliri, PDP House of Representatives Candidate for Ahiazu/Ezinihitte Federal Constituency, Chief Emeka Chinedu and former President General of Ezuruezu Mbaise, Dr. Okey Aguwa, described the development as a timely and a step in the right direction, noting that the state will be well governed with Ihedioha at the helm. Reacting on his adoption, Rt. Hon. Ihedioha, thanked the people Mbaise for the confidence reposed on him by the entire Owerri Zone and assured of his readiness to liberate the and rebuild the state from ruins of the present administration. Barr.I. O. Ekeocha, Eze Sir, Alozie, Eze D.N. Ugo, Eze Geoffrey Anyanwu, Eze Barr. Louis Nwokeke, Eze Anthony Anyanwu, Eze Joe BenOchulor, Eze Engr. G. C. Adiukwu, Eze Sir, JN. Amaefule, Eze Sir Major J.N Unegbu, Eze J.N. Nnamdi, Eze Pat Ihuoma, Eze (Prof) Nwachukwu, Eze Dr. Ogbonna, Eze Dr. Dennis Odiohanma.